Currently showing at the Minneapolis Institute of Arts, “World Beats: Global Contemporary Art” is an eclectic mix of paintings, painted photographs, sculpture and found-object art by eight artists whose works range from the glib to the ironic to the poignant. My choice for most dramatic impact is an arrangement of nine panels—from a larger group of 50—by Cy Thao, a Hmong-American whose family fled Laos in 1975, when Thao was three years old, and spent five years in a refugee camp in Thailand before migrating to the United States. 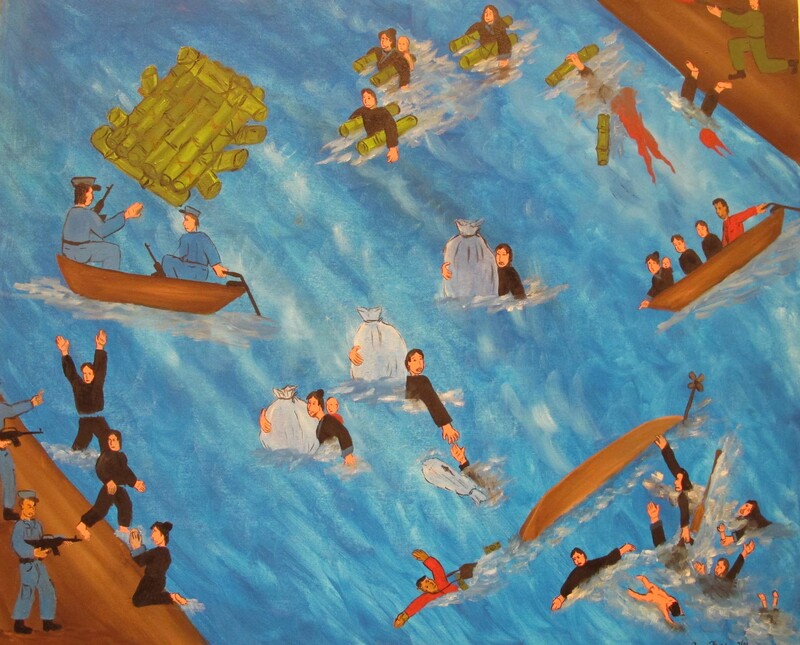 Thao’s work is a powerful view of Hmong experiences of the Southeast Asian war, which the United States waged against Vietnam, Laos and Cambodia throughout the 1960s and early 1970s. The panels tell a story of the Hmong transformation from peaceful villagers to war-ravaged refugees to outspoken U.S. citizens. We see them crossing rivers under gunfire; standing in lines for water in refugee camps; and saying tearful good-byes to friends and relatives left behind in the camps. For the Hmong, the consequences of the war do not end when they reach America. Thao explores the plight of Hmong youth being bullied in schoolyards and subjected to hate speech and racism. But Thao’s Hmong are not victims—either of the war or of their new American home. The last panel depicts their 1998 protest against hate speech, triggered by the remarks of a KQRS radio host. Thao’s panels bring to mind another Hmong artistic form, the embroidered “story cloths” Hmong women create that combine story, history and art. Like the story cloths, Thao covers the flat surface with diverse memories and experiences. His scenes and colors are jewel-like but unsentimental. The river escape panel, for example, neither exaggerates nor conceals the horror of men, women and children running from soldiers on both banks. Blood—slashes of angry red paint—contrasts with the placid blue of the river; a baby floats face down; and boats capsize in the chaos. The bird’s eye perspective Thao uses gives these scenes a sense of distance—in both space and time. They are reflections on the past, but they carry a powerful message for contemporary society and art. Thao demonstrates the resilience of a people, and proves that art can be “about” something other than itself and still be aesthetically moving. “World Beats: Global Contemporary Art” is showing in Gallery 276 and will run through Sunday, July 15, 2012.